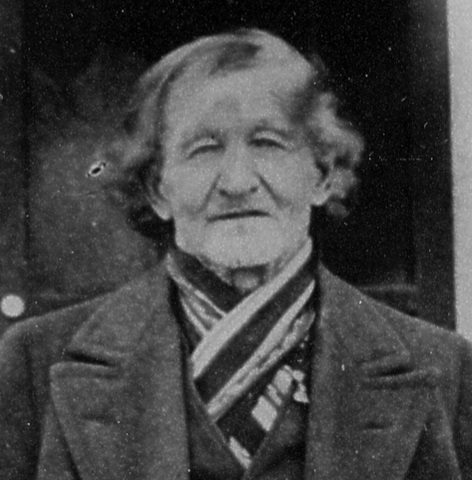 John Henry Wilson (c1828-1905) had been a dead-end ancestor. 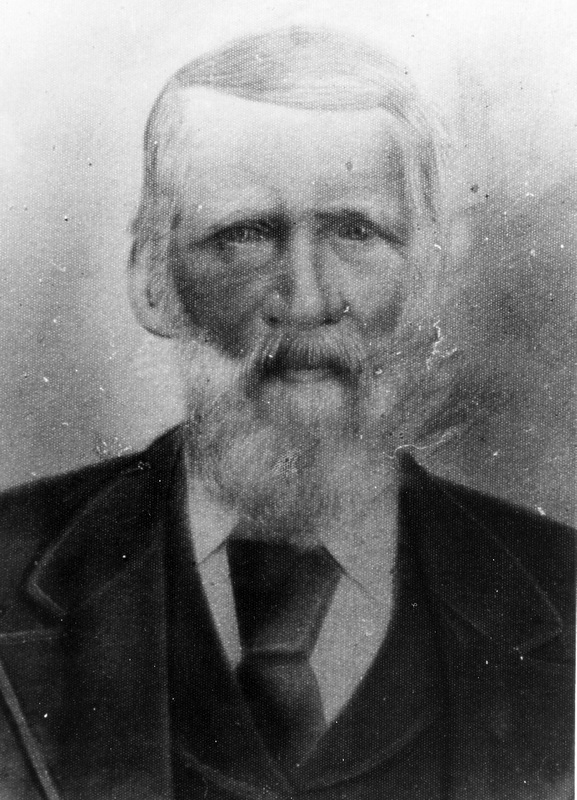 A Confederate veteran from Virginia, he brought his family in the 1880s to Jasper County, Missouri, where he served as a Justice of the Peace at the county courthouse in Carthage. 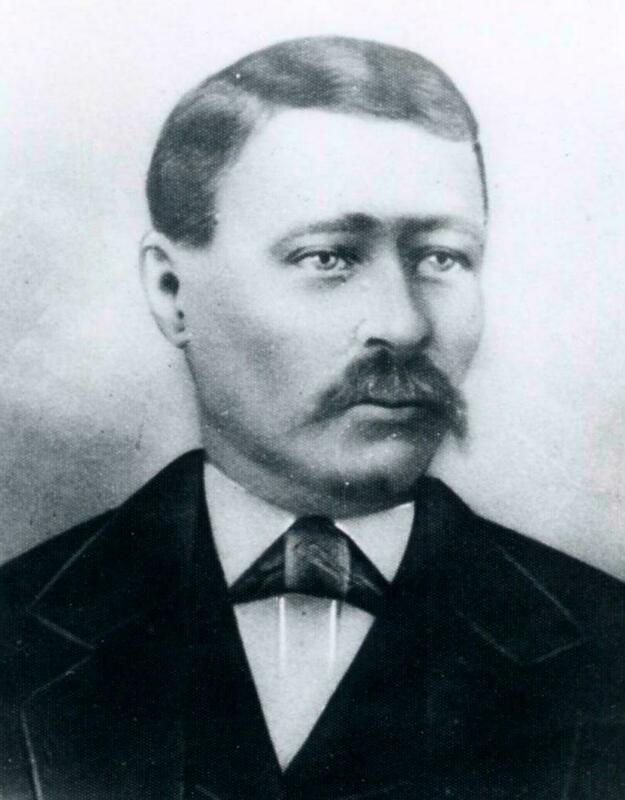 His son Henry Plummer “Plumb” Wilson married Ida Mae Coffer in Carthage on 28 May 1887. This is the earliest record of the Wilson family in Jasper County that we’ve found; their origins before that date – even the name of Henry Plummer Wilson’s mother – had been lost to the generations. Marriage of Henry P. Wilson to Miss Ida Coffer, Carthage, Missouri, 1887. It was the discovery of another marriage record – that of the late-in-life remarriage of Henry’s younger sister Lizzie – that would ultimately lead to the final clue needed to break down the brick wall in the Wilson line, at long last uncovering the Virginia origins of the Wilson family, the identity of Henry’s mother, and her surprising family connections to several prominent figures in American history. 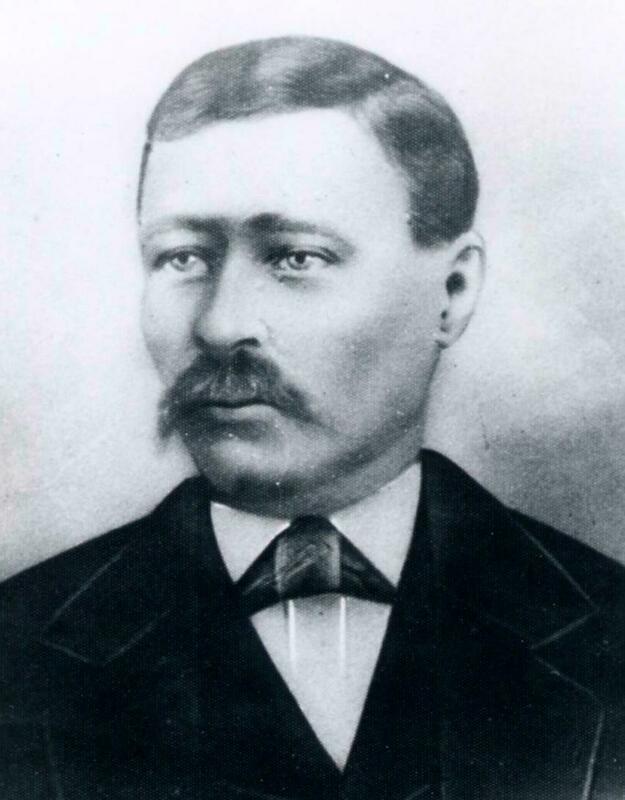 According to family recollections, Henry Wilson was a miner and a blacksmith; he had a brother named Ed and two sisters, Lizzie and Maud. Henry died of tuberculosis during the winter of 1899-1900, prior to the federal census date. The 1900 census of Carterville, Jasper County, Missouri shows Ida Wilson, widow, head of the household, with her five children and her widowed father-in-law John Wilson, age 77, born March 1823 in Virginia. Henry Wilson was called “Plumb” by the family. Even though he had died prior to the 1900 census date, the census taker visiting the Wilson home started to record his name, “Plumb,” then drew a line as if to cross it out. The remaining information on this line (relationship to head of house, race, gender, month and year of birth, age, marital status) refers to Anna, the oldest daughter of Ida and Henry “Plumb” Wilson. Thus the enigmatic name of “Plumb” Wilson is recorded in the 1900 census, even after his death. When John H. Wilson died on 16 September 1905 the newspaper death notices for him failed to mention the name of the wife who preceded him. 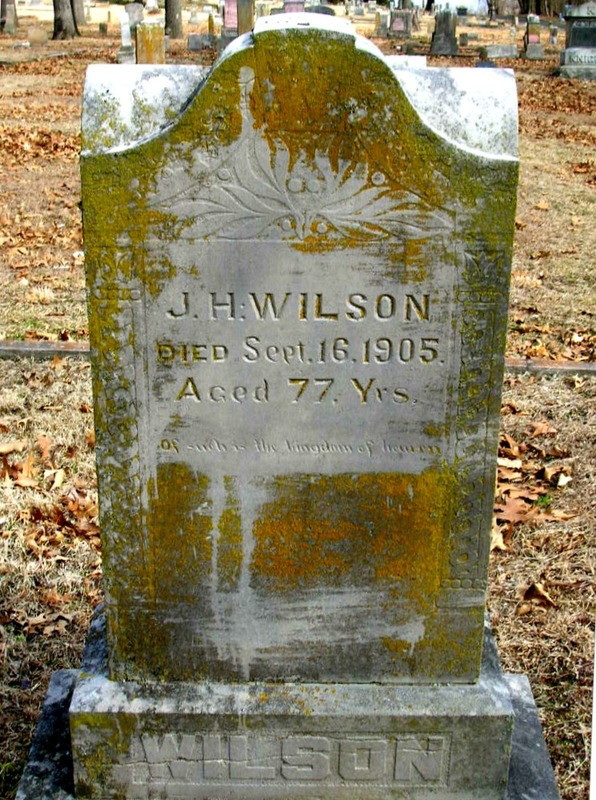 John H. Wilson and several members of his family are buried at Carterville Cemetery; but if his wife is buried there near him, there is no headstone engraved with her name and no burial record has been found. 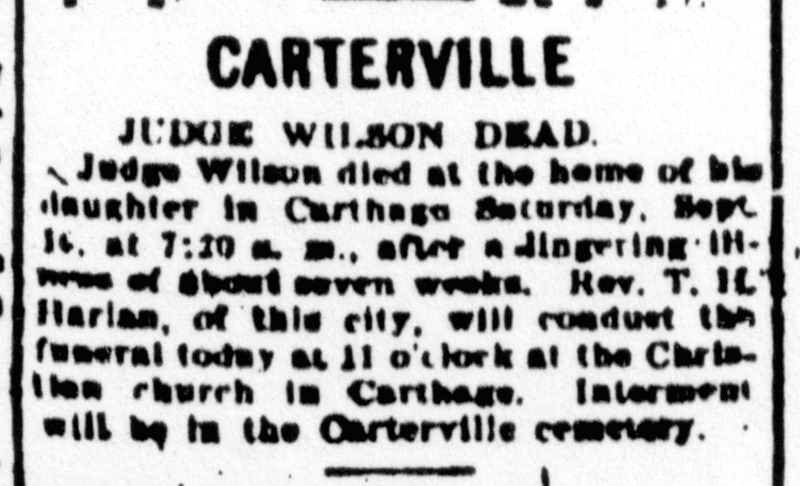 Death notice for J. H. Wilson, Jasper County Democrat, 19 September 1905, p.19. Where, in Virginia, did John Henry Wilson come from? Who was his wife? Where exactly did they reside before coming to Missouri in the 1880s? With a name like John Wilson, tracing his origin would prove an uphill battle. At first, we searched for clues to John Wilson’s military service hoping to identify his regiment and any information about where he came from. Although we knew he fought for the Confederacy, his regiment was not listed beside his name in the 1890 census veterans’ schedule. His death notices, located in three different newspapers, did not even mention his military service; nor was his regiment inscribed on his gravestone. Decades ago, on a trip to Richmond, my cousin Harry “Bobby” Wilson tried to locate John H. Wilson’s service records at the state archives. But with dozens of men with that name, and little additional identifying information to narrow down the field, the task was insurmountable. Even with the existence today of all the online databases for researching Civil War veterans – notably the National Parks Service “Soldiers and Sailors Database” and more recently Fold3.com – military records for our John Henry Wilson could not be identified without more information, such as his regiment or at least his place of enlistment. A precise place of birth for John Wilson’s children might lead to more records; not only his military records, but perhaps also his marriage record, census records, and other records preserved at the county level. An obvious place to look for a record of his son Henry’s place of birth would be Henry’s death certificate, perhaps a newspaper death notice, or other family record made during Henry’s lifetime or shortly after his death. When Henry Plummer Wilson died, in late 1899 or early 1900, no death certificate was created for him because the state of Missouri did not begin recording deaths – at the statewide level at least – until 1910. 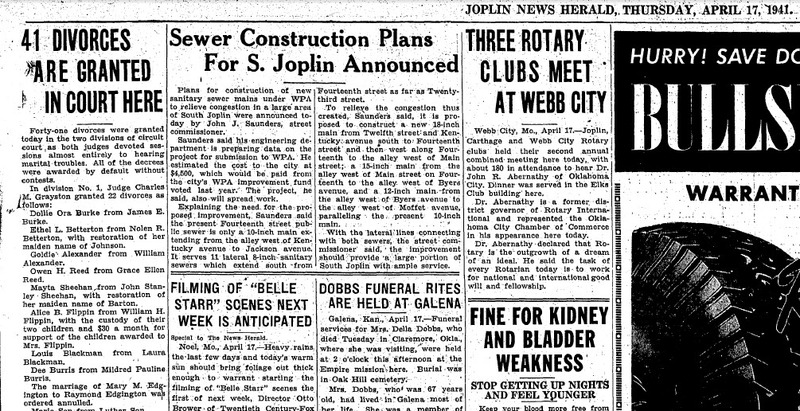 Cousin Bobby spent hours at the Joplin Public Library searching for Henry Wilson’s death notice, but Joplin area newspapers are incomplete for this period, and we don’t even know precisely when Henry died. No notice could be found. By researching the direct Wilson line, through Henry to his parents’ origins, we had reached a dead end. But by branching out to trace the movements of Henry’s siblings, could a death certificate for one of them be found? And would such a record lead us to the place of origin of the Wilson family? 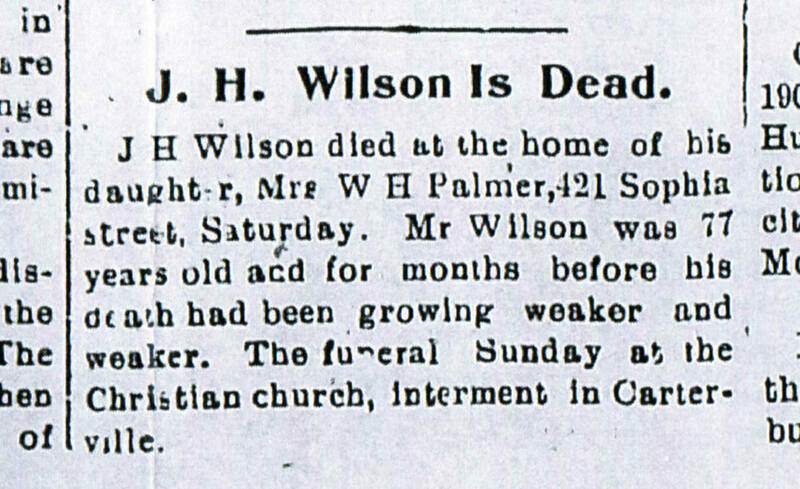 A death notice for John H. Wilson, published 19 September 1905 in the Jasper County Democrat, states that he died “at the home of his daughter, Mrs. W. H. Palmer, 421 Sophia Street,” in Carthage, Missouri. 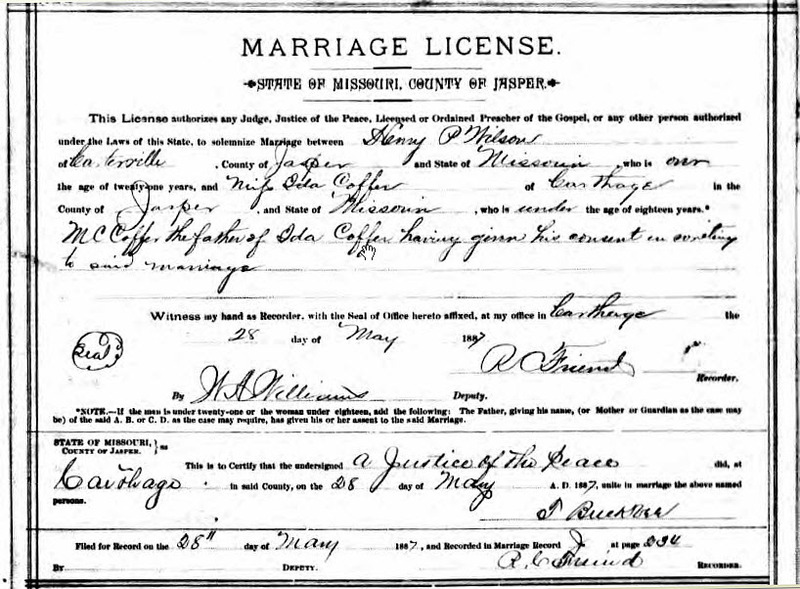 The marriage of Catherine E. Wilson to W. H. Palmer, 11 March 1900, is recorded in Carthage, Jasper County, Missouri. The 1900 census shows William H. Palmer, age 52, his wife Elizabeth, age 38 (born August 1862 in Virginia, father born in West Virginia and mother born in Virginia), and three Palmer children from a prior marriage. By 1910 the Palmers were residing in Blackfoot, Bingham County, Idaho, where they are found in federal census records in 1910, 1920 and 1930. William Harrison Palmer died 31 December 1935 in Blackfoot and is buried at Grove City Cemetery. But where was Lizzie Palmer’s death certificate? The Western States Marriage Index, provided for free by Brigham Young University, includes Idaho marriages for this period. According to the index, Lizzie Palmer married her second husband, Joseph Hendrickson, on 23 March 1939 at Rupert, Minidoka County, Idaho. 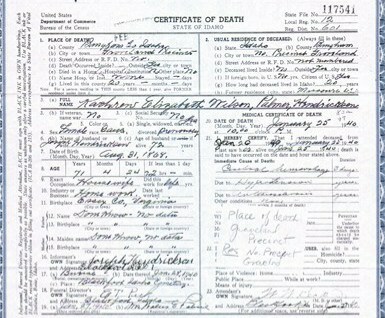 When she died, less than a year later in 1940, her death certificate thus bore the name “Katherine Elizabeth Wilson, Palmer, Hendrickson.” The informant, widower Joseph Hendrickson, did not know the names of Lizzie’s parents. But he gave her date of birth, 31 August 1868, and her place of birth: Essex County, Virginia. (She was actually born ten years earlier: further research would uncover a birth record in Essex County for “Catherine Eliz. Wilson,” daughter of John H. and Adeliza Wilson, born 31 August 1858). Finding Lizzie’s place of birth turned out to be the breakthrough we needed. A search of census and vital records for this family in Essex County, Virginia, finally revealed the name of John Henry Wilson’s wife and the mother of his children: Adeliza Derieux. A marriage record for John H. Wilson and Adeliza Derieux confirms the relationship; but this record cannot be found online. Turning to the book, Essex County, Virginia, Marriage Records: Transcripts of Consents, Affidavits, Minister Returns, and Marriage Licenses, Vol. I, 1850-1872, by Suzanne P. Derieux and Wesley E. Pippenger, we find that Catherine Derieux applied to the Clerk of the Court of Essex County, Virginia, for a marriage license for “my daughter and ward Adeliza Derieux and Mr. John H. Wilson” on 31 January 1853. The two were married on 1 February 1853. Further research shows that Catherine Derieux, formerly Catherine Croxton, was the daughter of John and Milly Croxton and the widow of Peter Derieux. Catherine, Adeliza’s mother, died about 1854. Several of Adeliza’s siblings are found in the John H. Wilson household in 1860. Adeliza was thus the daughter of Peter Derieux (1800-1849), whose birth is recorded in the Derieux family bible, held by the Virginia Historical Society. 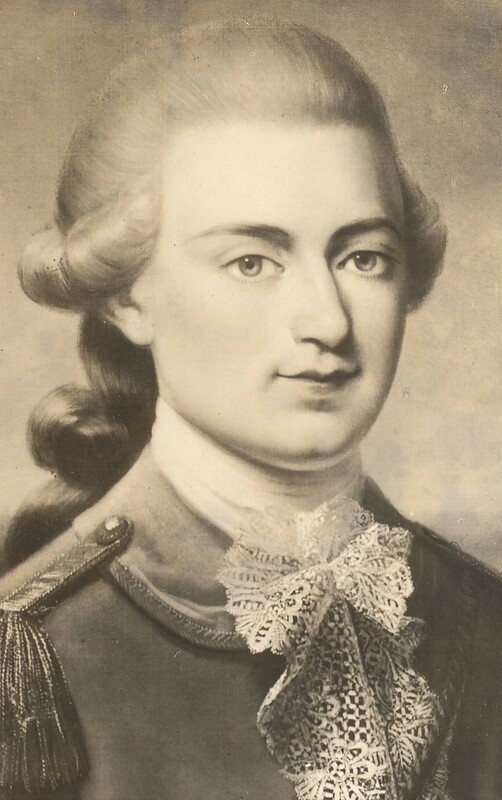 Peter was the youngest son of our immigrant ancestor Justin Pierre Plumard, Comte de Rieux, of France (1756-1824). 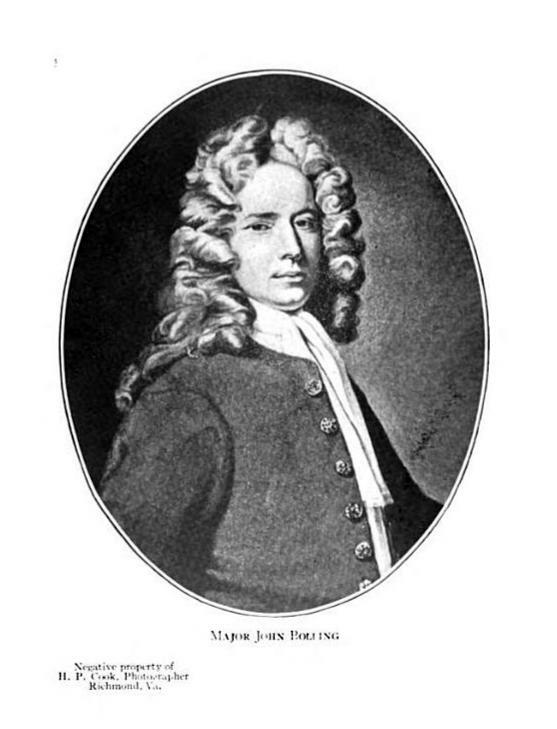 J. P. P. Derieux, as he later styled himself, married the step-daughter of Philip Mazzei, the close friend and neighbor of Thomas Jefferson who has been called “Godfather” of the Declaration of Independence. Mazzei’s wife, Adeliza’s great-grandmother, is buried in the graveyard at Monticello. Adeliza’s younger sister, Emma Susan Derieux, married Thomas Bolling Skipwith, Jr., a great-grandson on his father’s side of both William Skipwith of “Prestwould” and of John Wayles, father of Martha (Wayles) Jefferson and, probably, of Sally Hemmings. 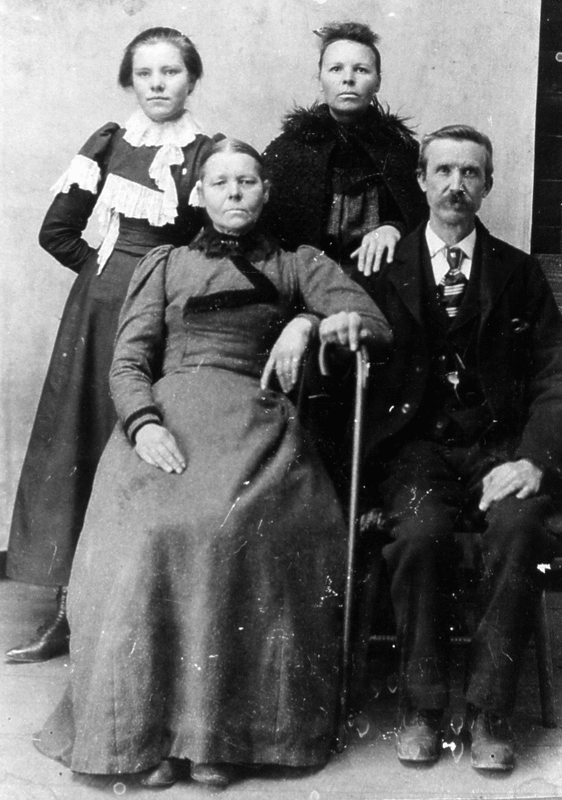 The Wilson family and their children were identified in the Essex County census in 1880, 1870 and 1860. A man by the name John Henry Wilson, with the same age and profession (attorney) as our ancestor, living eighteen miles from the county seat of Tappahannock, enlisted as Sergeant in the Ninth Virginia Cavalry. He would soon be promoted to Lieutenant. According to the book Ninth Virginia Cavalry, by Robert Krick, a member of his company described John H. Wilson as “one of the homliest” of men, with a “thin sandy beard.” (Having seen my ancestor’s photograph, I’m satisfied this is the same man). At last, we know something about the origin of our Wilson family and the source of Henry Plummer “Plumb” Wilson’s unusual middle name: it was the French ancestral family name, Plumard. We still have many unanswered questions about John Henry Wilson, such as where he was born, the identity of his parents, and how he received his legal education. We also have yet to discover when Adeliza died and where she was laid to rest. But had it not been for internet resources – in this case specifically the Western States Marriage Index – we might never had known that Aunt Lizzie Palmer remarried shortly before her death, and that her death certificate would therefore be found in the name, Hendrickson. 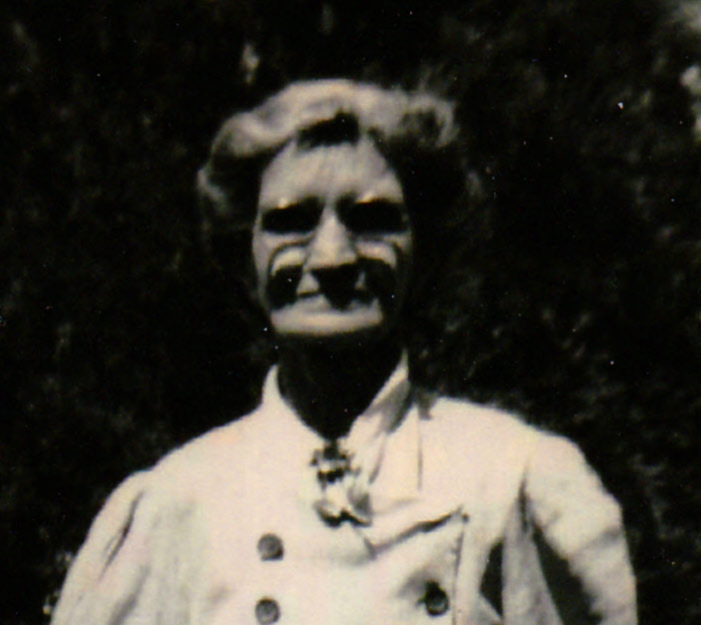 To the Craig family, Mrs. Cora Craig (1881-1971) was beloved wife, mother, and grandmother. A dozen or more family trees on Ancestry.com give Cora Anderson’s date of birth as her date of death as well. Evidently, no other trace of Cora had ever been found by these Anderson family historians. But the documents in Gus Anderson’s pension file showed that Cora was still living as late as 1915. So, what happened to Cora Anderson? She was born in 1881, so of course she isn’t listed with the Anderson family in the 1880 census. The twenty-year gap in the census record (most of the 1890 census was accidentally destroyed by fire) means that by the time the 1900 census came around, Cora could have been deceased. Or, she could have been married and listed in the census under her husband’s last name. 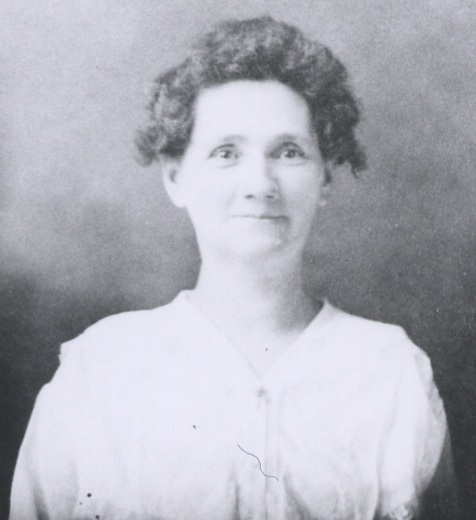 Database searches of marriage records for “Cora Anderson” in Newton County, Missouri, and surrounding counties in Missouri and Kansas turned up no hits. 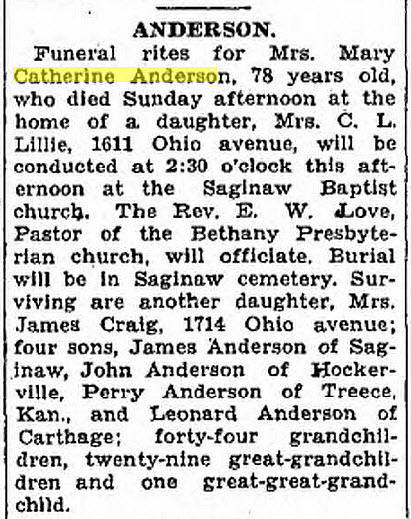 It was the Joplin Globe, 9 October 1928, obituary for Cora’s mother, Mary Catherine (Moser) Anderson (1849-1928), that provided the missing surname: the list of survivors included “Mrs. James Craig, 1714 Ohio Avenue.” All of the other Anderson daughters’ married names were known. Was Mrs. James Craig our missing Cora? A search for James Craig in the 1930 Joplin census found him living at 1714 Ohio Avenue with his wife, Cora M. Craig. Bingo! Mrs. James Craig’s first name was Cora. But it would be great if we could find some documentation showing Cora Craig’s maiden name. I checked the Missouri Digital Heritage database for her death certificate – nothing came up. Although James H. Craig (1876-1941) is listed on Findagrave.com at the Saginaw Cemetery, there is no (as of today) photograph of his headstone. The volunteer who created his memorial page did note that his wife was Cora Anderson Craig but did not create a separate memorial page for her. Notably, this is the very cemetery where the parents of the mystery Cora Anderson and many of her siblings are buried. Excellent circumstantial evidence that this is “our” Cora Anderson. But wouldn’t it be nice if we could find a marriage record for Mr. and Mrs. James Craig, showing Cora’s maiden name? Another search for marriages, this time giving the names of both parties, uncovered a record for a marriage between Cora Anderson and James H. Craig, taking place on 6 February 1898 in Newton County, Missouri. The bride’s father, “A. A. Anderson,” is noted as having given his consent to the marriage as the bride was under the age of 18. At last, everything lines up. The marriage record shows not only that Cora Craig’s maiden name was Anderson, but that “A. A. Anderson” was her father. Why had we found no death certificate for Cora Craig? That one’s easy. According to the Social Security Death Index, Cora Craig died 15 April 1971. I hadn’t found a death certificate online because Missouri death certificates for 1971 are not available online – the Missouri Digital Heritage site currently contains death certificates 1910-1962 (as well as some earlier death and still birth records). Her obituary in the 20 April 1971 Joplin Globe confirms that this is, indeed, our Cora, widow of James Craig who had preceded her by thirty years. Why did searching for a marriage record for Cora Anderson (without a spouse’s name) on FamilySearch.org produce no results? That’s a harder question to answer. Even limiting the search to “Missouri” and a range of years from 1885-1900 didn’t get a hit for our Cora. The lesson: If woman born in the early 1880s isn’t found in the 1900 census with her family of origin, and a marriage record cannot be found, don’t assume she died. She could be alive and well, living with her husband (and under her husband’s name), perhaps right where you’d expect to find her. Cora lived her entire adult life in the Saginaw area, close to her loved ones. She’s even buried in the same cemetery as her parents and many of her siblings, right there in Saginaw. Her mother’s obituary, with its list of surviving children, gave us the clue we needed in order to find Cora – her married surname. Anna (Sprague) Bergen (1866-1951) was raised by a couple named William H. and Nancy E. Clapper in Queens, New York. Anna was very close to her adoptive mother, Nancy, as was Anna’s daughter Edith (Bergen) Hottinger. Nancy and Edith were even buried together in Genola Cemetery in East Northport, Long Island, where they share a headstone. 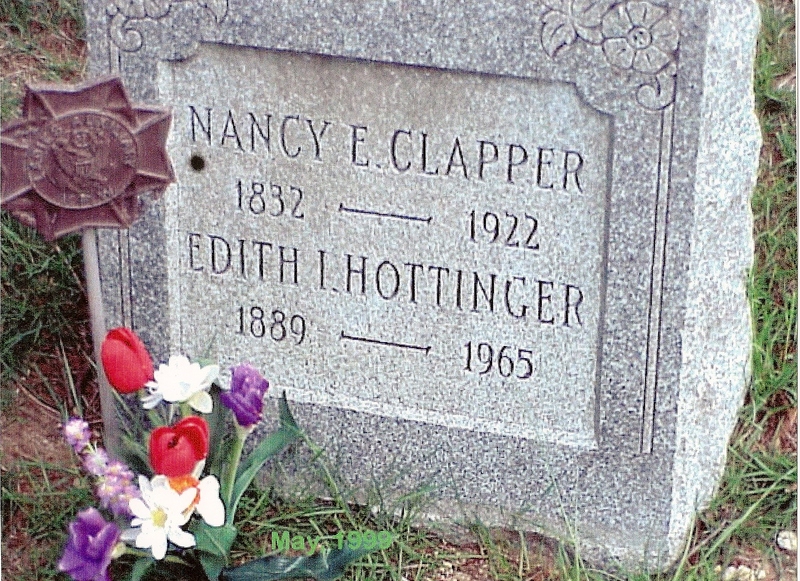 It was believed that Anna and Nancy were somehow related, but no one in the family knew Nancy Clapper’s maiden name. Searches for Nancy’s death certificate and marriage record were unsuccessful, and Nancy’s will contained no clues to a biological relationship to Anna. In the course of researching Anna’s husband, Frank Bergen, it was discovered that Frank’s mother’s maiden name was Harriett Vandusen. 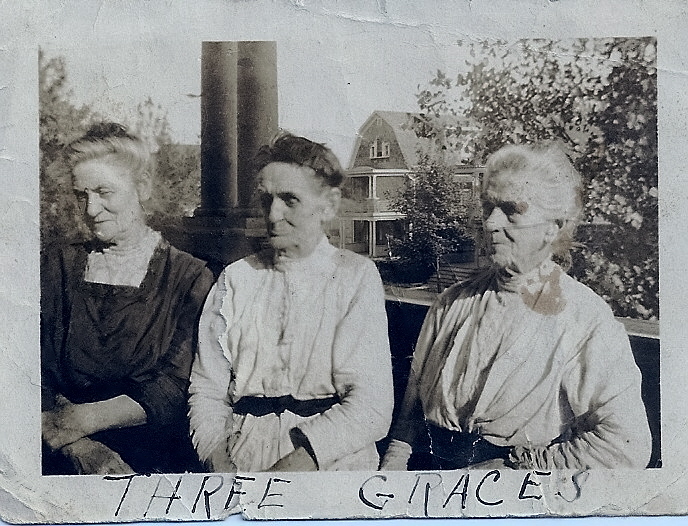 A 1916 photograph that had been handed down within the family showed Nancy Clapper with two women who our research showed were sisters, Priscilla Vandusen (who never married) and Julia (Vandusen) Pickard. Julia, Priscilla and Nancy. Long Island, 1916. Three Vandusen sisters – Priscilla, Julia and Harriett – are listed with their parents in Brooklyn in the 1860 federal census. Harriet does not appear in the 1916 photo – she died in 1905. But why was Nancy Clapper in the photo? Was Nancy also a Vandusen? It was just a hunch. A hypothesis, based on circumstantial evidence. Pure speculation. But we had run out of better ideas, so this hunch seemed worth investigating. Although Nancy, born in 1832, was the right age to be a Vandusen sister, we couldn’t place Nancy in an early census with the Vandusen family. Nancy married William Clapper in 1856 (according to the 1900 census), and the Vandusen family could not be found anywhere in the 1850 federal census. At a temporary dead end researching Nancy, we turned to her husband William H. Clapper (1834-1900). His probate file mentioned his siblings’ names and gave their street addresses, which we used to find them in the 1900 census and discover their years of birth. This information made it possible to place William with his family of origin and trace the Clapper family a generation further back in the census. In 1855, a year before William married Nancy, the Clapper family was found in the New York state census living in Brooklyn, Kings County, New York. I used screen capture software to copy the 1855 New York census page showing the Clapper family from FamilySearch.org. In the process of attaching the image to my database, I glanced across the page. I still cannot believe I almost missed it. There, two families up from the Clappers, was the family of John and Louvina Vandusen, with their six children: Eliza N., Priscilla, Geo. W., Julia, Harriett J., and Annetta. Eliza N. Vandusen, age 22, was the correct age to be the woman we were looking for, Nancy E. Clapper. So, it turned out that Eliza N. “Nancy” (Vandusen) Clapper was not (as far as we know) related by blood to her adopted daughter Anna. But Frank Bergen, the son of Harriett (Vandusen) Bergen, was Nancy’s nephew. He married Anna in 1887. The lesson: Always look beyond the index. Pull up the image of the actual census page. The information recorded by the census taker may not be the same as what is found in the index. Plus, you can see who was living close by. You may experience the serendipity of finding a missing person, and overcoming a brick wall, just by taking the time to look. When entering names into search boxes doesn’t produce the expected results, you may not have exhausted your resources. For some reason, John Vandusen’s family didn’t come up in the 1855 New York census when I searched for him by name on FamilySearch. But since Nancy married William Clapper in 1856, it isn’t too surprising that their families would have been neighbors in 1855. Consider looking at the actual census page images in the location where you would expect your family to be residing. After all, this is how census research was done in the days before online databases and before printed indexes. The “old school” method required scanning the census on microfilm, one page at a time. 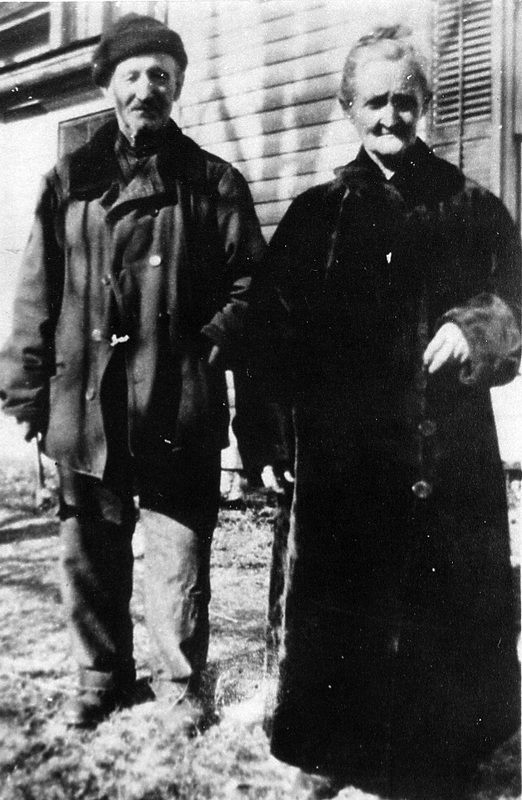 My grandmother and her cousin told the story of their French immigrant grandfather, Victor Meslin (1843-1932), as it had been told to them by Victor’s daughters. The story was that Victor had run away from home at the age of eleven, stowed away in a ship, and arrived all alone in America. He somehow ended up in Missouri, where he served the United States in the Civil War and earned his U.S. citizenship. Family tradition holds that when he married Louise Johnson he was 30 years old, she only thirteen. Louise’s father, a medical doctor, thereupon disowned Louise – not because she’d eloped at such a tender age, nor because she’d married a foreigner. The reason her family shunned her, as my grandmother understood it, was because Victor was a Yankee. 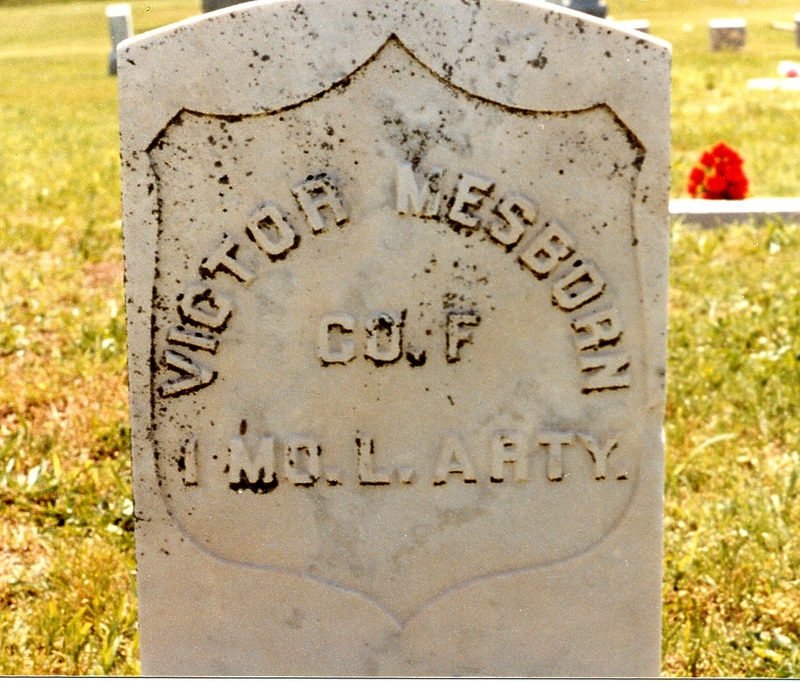 Family tradition has it that Victor’s ancestral surname was neither Mesborn, the name that appears on his military records and gravestone, nor Meslin, the name he used after the Civil War. But none of the Meslin grandchildren remembered his “real” name. My grandmother believed that Victor’s surname was incorrect on his military records, that numerous letters were sent to the government to correct the mistake, but that the letters were ignored and the error was inscribed on his gravestone. Victor’s Civil War pension file provided plenty of details about my ancestor’s military service, as well as his life after the war. There are, indeed, letters from Victor in the file claiming that his last name was Meslin, not Mesborn. A note in the file written by an employee of the Pension Bureau mentions a handwritten birth record that Victor submitted (the actual birth record is not in the file; evidently it was returned to Victor). This note states that the request to change the name on Victor’s records from Mesborn to Meslin should not be allowed because the surnames of the children on the birth record were neither Mesborn nor Meslin – but the note does not state what that surname actually was. The story of Victor coming to America as a stowaway is not reported in the pension file. However, another pension file was found for one “Enriette Barbier,” mother of deceased soldier Francis Meslin who enlisted at Perry County, Missouri. Census research did not reveal a connection between Victor Mesborn and Francis Meslin, nor between Victor and the Barbier family of Perry County (“Enrietta Cola” married Claude H. N. Barbier, in Perry County, on 19 August 1855). However, one document in Mrs. Barbier’s file was a letter from her son Francis Meslin, written in French, in which he mentions the name “Victor.” That letter spurred me to continue looking for a connection between my ancestor, Victor, and this Francis Meslin. In his pension application, Victor stated his place of birth was Salins-les-Bains, Department Jura, France. Through the LDS Family History Library, I obtained and searched microfilmed birth records from Salins-les-Bains and located a birth record for Victor MEZALAINE, born 30 January 1843. His mother was Jeanne Henriette Colin (French pronunciation would sound something like “Co-lah”), wife of Michel Louis Mezalaine. Further research into the birth registry of Salins-les-Bains revealed that Jeanne Henriette was the mother of nine children, eight of whom (including one Francois Xavier “Francis” Mezalaine/Meslin) would later emigrate to the United States. She was the same “Enrietta” who married Claude Barbier in 1855. (Catholic baptism, marriage and burial records maintained by Saint Mary’s of the Barrens Church in Perryville, Missouri, which were later translated and published by the Perry County Historical Society, provided crucial details about this group of Nineteenth-Century French immigrants). So although Victor does not appear with the family of his mother in the 1860 or 1870 census, it is clear that his mother and many of his siblings emigrated from France around the same time that he did. But could he have traveled separately, as a stowaway? The family tradition of Victor stowing away in a ship was finally refuted when we found a passenger list, showing “Jeanne Melin” and her children crossing on the ship Old England from Le Havre, France, arriving in New Orleans on 21 October 1852. There is a “Victor,” age eleven, on this list. Several of Victor’s siblings are also named on the list, including his sister Marie Camille, who would later marry fellow Old England passenger Jean Claude “Red” Meunier/Moonier. The tradition that Louise was only thirteen years old when she married Victor appears to be valid. Her death certificate gives 26 August 1859 as her date of birth, and census research identified her as one year old in the 1860 census, making her just two months past her thirteenth birthday on the date of her marriage in 1872. But her father, Elijah Johnson, could not have “disowned” her for marrying Victor, as her father had died in 1864 (his estate was probated in Cape Girardeau County). What happened to Louise’s mother and two young sisters after her father’s death? A marriage record for Mary Angeline Johnson to Ransom Warren, on 13 Mar 1867, was recorded in Stoddard County, Missouri. In the 1870 census of Johnson County, Illinois, “Leweza” Johnson, age 12, along with her sisters Caroline Johnson, age 10, and Jane Johnson, age 9, are found in the household of Ransom and Mary Warren. 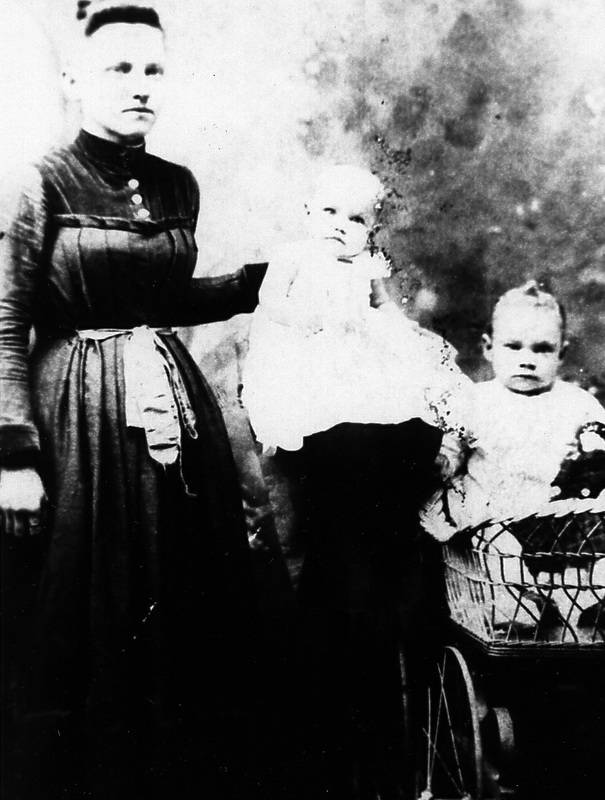 After locating the Warren family in the 1880 and 1900 censuses, and connecting up with descendants of Louise’s sisters, I confirmed that this Mary Warren was Louise’s mother. It was perhaps Louise’s step-father, Ransom Warren, then, who “disowned” or at least reproached Louise for marrying a Yankee. 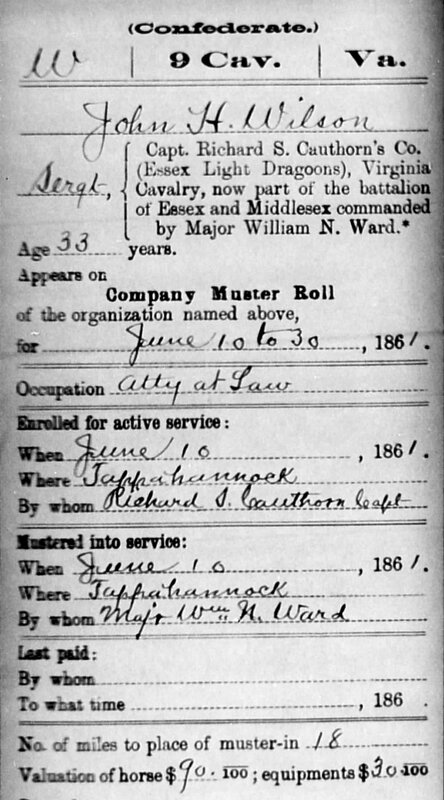 Confederate service records show that a man named Ransom Warren had served in Jeffers’ Regiment of the Missouri Cavalry, a Confederate organization. Warren’s obituary stated that he was a member of “R. E. Lee camp 158, U.C.V.”, a Confederate Veterans’ organization. (Fort Worth Star Telegram, 4 May 1908). It would seem that family stories and traditions, passed down by word of mouth from generation to generation, are seldom entirely trustworthy. Yet they may contain nuggets of truth, clues worth investigating, leads worth following. 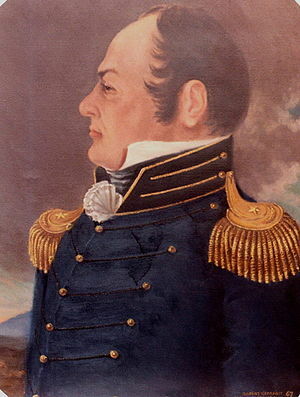 The statement that Victor stowed away on a ship, and had come to the United States completely on his own, was shown to be false. But other details of the Meslin family tradition – even surprising ones, like Louise’s age at her marriage – were supported through research. Studying this family has taught me to question everything, to assume nothing, and to never stop documenting. My Civil War-era ancestor, John Henry Wilson (1823-1905), was one big brick wall. Back in the mid-1980s my great-grandma Winnie (Wilson) Mesplay had given us his photograph, with some handwritten names penciled on the back, and told us he had been a teacher and Justice of the Peace in Jasper County, Missouri. She thought he may have been a soldier during the Civil War, but she didn’t know where he came from or anything about his military service. He died in 1905, five years before the state of Missouri started making death certificates. I already knew how to research Civil War pension files for Union veterans, but we didn’t even know what side John Henry Wilson fought on. And with a name like “John Henry Wilson,” how would I ever identify the right person in the records? I tried searching for “John Wilson” in The Civil War Soldiers and Sailors Database – there were over 800 Confederate soldiers with that name, and over 2,000 Union soldiers! 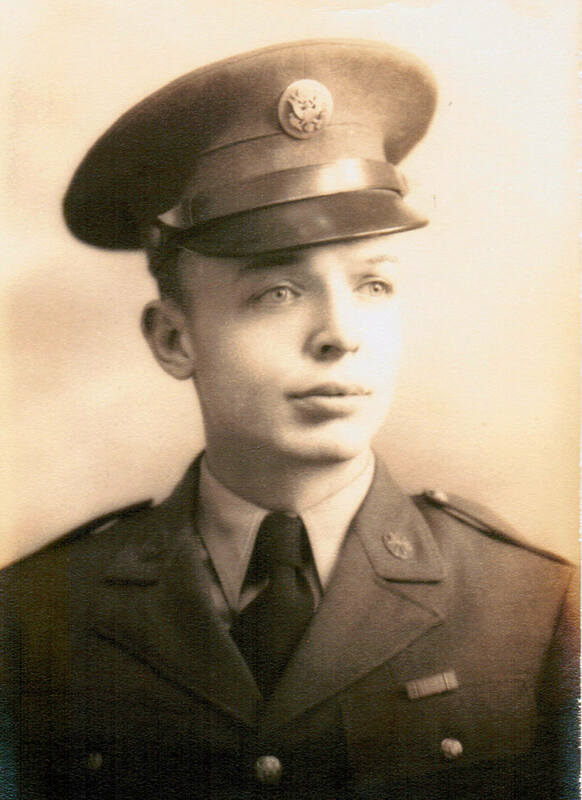 If I could find out what unit he served in, that would help me narrow in and see if he had a pension, or other military service-related records that might help me get to know this man a little better. Many veterans’ gravestones will list their unit. We knew he was buried in Carterville Cemetery, and my dad had taken a picture of the headstone during his last visit. Unfortunately, nothing about John Henry Wilson’s military service is carved on his stone. I called the reference desk at the Carterville Library and gave them John Henry Wilson’s date of death. The librarian there got back to me with two different death notices from different local newspapers, and she suggested I contact the Joplin Public Library as well. The reference librarian in Joplin emailed me a third death notice. Interestingly, one of the three newspapers referred to him as “Judge Wilson.” But none of the death notices stated anything about where John Henry Wilson had come from, what unit he served in, whether he was a member of a veterans’ organization, or on what side he fought – if he had fought at all. Dead end. Until I found out about the 1890 census Veterans’ Schedules. You may have heard that the original 1890 federal census pages were destroyed in a fire in 1921 at the Commerce Department building in Washington, DC. Well, it’s true. For many families, the twenty-year gap between the 1880 and 1900 census records creates a serious roadblock in research. But several “fragments” of the 1890 census survived, and one of the most useful sections of the remaining 1890 census are the Veterans’ Schedule pages, which are searchable on both Ancestry.com and FamilySearch.org. I had already found my third great-grandfather, John Wilson, in the 1900 census. He was listed in the household of his recently widowed daughter-in-law, Ida (Coffer) Wilson, my second great-grandmother, and her five young children (including my great grandma Winnie, who was seven months old). His place of birth is given as “Virginia” – and Virginia is also given as the place of birth of the father of Ida’s children. (He was John Wilson’s son, Henry Plummer “Plum” Wilson, my second great-grandfather). Since John Henry Wilson was in Jasper County in 1900, I decided to look for him in the same place in the 1890 Veterans Schedule. This schedule includes the name of the veteran (or his widow), his rank, company, regiment, dates of enlistment and discharge, and information about any disability. The census taker for Carterville, who enumerated 12 pages of veterans, may have been confused about which veterans he was supposed to record. He (or someone) drew lines through several of the names and marked “Conf.” beside those names. Confederates. So, John H. Wilson was a Confederate veteran. But beside his name, the spaces for his company and regiment are left blank. Still no regiment, but I’m getting warmer. He fought for the South, and he had a son born in Virginia in the 1850s. I’ve narrowed down my search. Harriett Elizabeth (Bowling) Martin (1846-1938) of Patrick County, Virginia, midwife, Confederate widow and descendant of Pocahontas, used to be my third great-grandmother. By that I mean she used be in my family tree, my direct lineal ancestor. She was my paternal grandfather’s great-grandmother. Until, one day, she wasn’t. For more than twenty years I’d known of Harriet, and of the Martins of Patrick County, and I’d worked at documenting their lives from a distance of both time and geography. 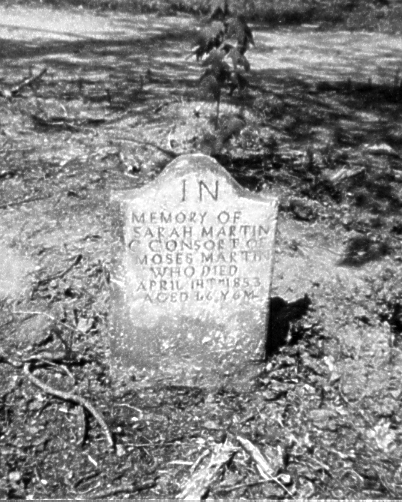 There were, and are, many Martins in Southern Virginia, and I was bound to be related to most of them. My charts showed my father’s father, B.I. Martin, was born there in 1919, the son of two Martins – Charlie Martin and his wife Agnes (Martin) Martin, a third cousin. Charlie and Agnes’ common ancestors, Moses and Philadelphia Martin, were themselves first cousins. Moses and Philadelphia’s grandfather, Isaac Martin (1720-1774), is said to have been the less-distinguished brother of General Joseph Martin, a patriot of the Revolutionary War. My dad, who grew up in his mother’s hometown in Missouri, never knew his father. B.I. Martin had been stationed in Japan shortly after WWII and died there in a boating accident. As an adult, with no connection to his father’s side of the family, my dad had researched the Martins at the Patrick County Historical Society and Museum in Stuart, Virginia. It was through the historical society that he contacted kin, borrowed and copied old family photographs, and located gravesites. Together we scanned and labeled Martin family photos going back four generations. I posted some of the photos to my family tree on Ancestry.com, and connected up with other distant relations. I found a cousin online, Connie, who shared stories passed down from her mother about great-grandmother Harriet. She’d been the mother of ten children, nine of whom lived to adulthood. (Martin women, it has been said, would give birth in the morning, then go and prepare a lunch for their family at noon). In Harriet’s later years she was stern with the little ones, maybe as stern as she looks in her photographs. As the local midwife she assisted the county doc at childbed, and she laid out the dead for burial. And when Harriet decided it was time for her to retire from midwifery, the doc retired, too. I was fascinated by Harriet Bowling Martin’s story and by her ancestry. 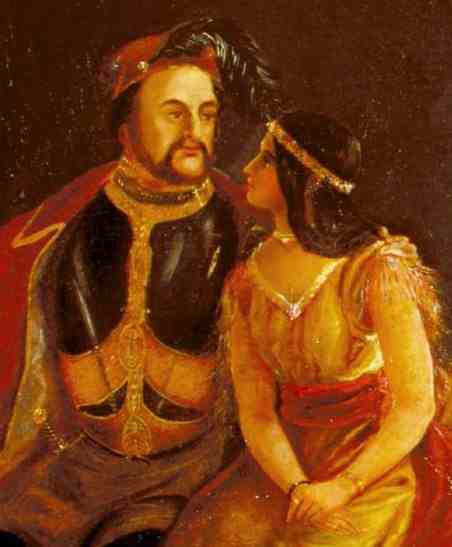 The Bowlings of Southern Virginia can claim descent from Major John Fairfax Bolling (1676-1729), the great-grandson of Virginia colonist John Rolfe and his wife Pocahontas, daughter of Chief Powhatan. But one day in April 2012, not long after the 1940 census had been released to the public by the National Archives for researchers to access, I made an unexpected discovery. I was searching 1940s-era records in Ancestry.com, hoping to find a city directory showing the street address of my father’s mother. (The 1940 census had not yet been indexed by name, so a street address was the only way you’d find the family you were looking for). I’d found her parents in 1940, but she wasn’t living with them. Searching under her maiden name, up popped a 1940 marriage record from the county where she’d lived. It wasn’t a city directory, like I had been looking for, so I almost skipped past it in my search results. But something told me to pull it up – I’d researched this family and this area enough to know that there was only one woman by that name in Jasper County in 1940. So, my grandmother had gotten married on 7 December 1940, to a man named Raymond Edgington. I did some quick mental math. My dad was born in September 1941. We already knew grandma had married B.I. Martin about seven months after my dad was born – she’d explained that they’d had to postpone the wedding because B.I. was away in the Army. I called the county courthouse to ask if they could check for a divorce record from 1940 or 1941, for a Mr. and Mrs. Raymond Edgington. A few hours later, I was holding a two-page fax in my hands. It was not a divorce. It was an annulment – on the grounds that both Ray Edgington, age 20, and my grandmother, age 19, were both below the legal age to contract marriage without parental consent. My grandmother’s step-father, acting on his step-daughter’s behalf, was plaintiff. He told the judge that the young couple had never lived together as man and wife. It appears he did not know that his 19-year-old step-daughter – my grandma – was already three to four months pregnant. By the time my dad’s birth certificate was recorded with the state, four years later, his mother was married to her second husband, B.I. Martin. The man named on my father’s birth certificate was not Dad’s biological father. I never did see much resemblance, now that I think about it, in those old Martin family photographs. A older relative of mine (a very, very distant relative, indeed!) needed some help researching her family history. Both her parents were born in New York City in the 1910s (her father in Manhattan, her mother in Brooklyn), and although she’d been using Ancestry.com and had a lot of information, there were still many “blanks” where her New York ancestry was concerned. None of my people are from New York. With no experience in New York genealogical resources, I started with Google and Cyndislist to get an idea of what online resources might be out there, to see what she might have overlooked. Using free, online web sites, we were able to find an astonishing amount of information about her family – information that was not available on Ancestry.com! I mean, we hit the jackpot. It turned out she is descended from two very, very old New York families, the Bergen family and the Vandusen family, who each have been traced back to the 1600s and beyond. Not only that, but we were able to identify the parents and grandparents of my relative’s maternal grandmother – who had been adopted at the age of six! This was a discovery we never even anticipated we’d be able to make. And it was all done using online sources and databases that are totally FREE to use. Most people doing genealogy research are familiar with the U.S. Census. Taken every decade, the federal census began in 1790 and started reporting the full names of all family members (not just the head of household) in 1850. So, going backward in time, starting with the 1940 census which was released in February, 2012, you can find a kind of snapshot of your family every ten years. Using the federal census, you can usually trace your parents, grandparents, great-grandparents and so on, back to (at least) 1850 if they were living in the United States. When you first started researching your family tree, the U.S. Census was probably one of the first sources you learned to search. But what a lot of people don’t know is that the state of New York took its own separate census, and that some of these state census records are available for free online – but only a handful of these New York state censuses are available on Ancestry.com. If you know where to look, and if you know the techniques to use to find the names you’re looking for, these state census records can be the key to breaking through brick walls in your research. The New York State Census was taken in different years from the U.S. (federal) Census, so the state census can supplement the information from the federal census records, filling in gaps and answering key questions such as a person’s age and occupation, his or her place of birth, and where a family was living on a given date. The 1892 New York state census is incredibly crucial if you’re researching this time period, since the 1890 federal census was almost entirely destroyed. Another essential source of family history information comes from vital records, such as birth certificates, death certificates and marriage records. Most states, including New York, did not begin recording birth and death records officially on a statewide basis until 1910. But New York City records were (and still are) maintained by a separate agency from the rest of the state. So, for life events (births, marriages and deaths) that occurred in one of the five boroughs (Manhattan, Brooklyn, Bronx, Queens and Staten Island), the city’s Municipal Archives may have a record. Searching through these records personally sounds like a daunting task. If you don’t live in New York City, or you’re not sure if you want hire a researcher to search at the Municipal Archives for you, there are ways to identify the records you need without leaving your computer. There is a free, searchable database index of New York City vital records going back as early as 1862. The index was created by volunteers who had to read the handwritten original records and manually enter the names and dates, so some specialized searching may be necessary to find names with unusual spellings, or names that might have been misread by the person entering the data. Using these specialized search techniques, we found death certificates that took our research back a further generation, and a marriage record that provided the missing maiden name for my relative’s second great-grandmother. Newspapers can be an incredible means to not only extract names, dates and facts, but to flesh out the details in your family history and bring your ancestors to life. From birth and marriage announcements, to real estate and probate notices, and, of course death notices and obituaries, newspapers can give you vital clues and information you might not be able to find anywhere else. While researching my relative’s great-grandfather, Frank Bergen, a house painter from Brooklyn, I uncovered newspaper articles from the 1860s discussing a rather scandalous court case that involved Bergen’s mother and father. As the courtroom drama unfolded in the press, incredible details about their lives were reported. It’s the kind of story that would never have been discussed among the younger family members in those days, and so these facts were never handed down as part of the family saga. But it’s a story that enlivens and enriches my relative’s family history today. In my illustrated eBook, I’ll take you step-by-step through the process of finding New York state census records, vital records and newspaper articles, and I’ll show how these free online resources answered nagging questions, opened up new avenues of research, and filled in missing chapters in my relative’s family tree. I am hopeful that when you see these examples, and you understand the methods I used to locate the information we were looking for, you’ll be able to apply the same techniques to researching your own New York ancestors – and you won’t have to pay a penny to join a subscription site. These are all free resources available online, to anyone who knows where to find them and how to use them. For information about the release date of my eBook, please send an email to me at: amysuesmith@yahoo.com. I’ll also send you the list of the free online sources we used to complete this research project.